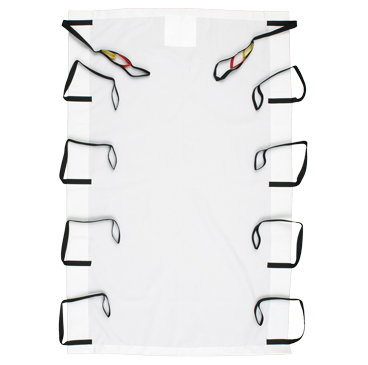 Our disposable mutli-use belt sling is designed to move a patient easily and comfortably. Composed of breathable material, this sling has a unique ‘Sling Management System’ which adapts to electronic inventory management systems minimizing the guesswork in sling size selection. This sling incorporates a non-slip padded back panel and a multi-loop adjustable interface. Maximum patient weight is 500 pounds. Compatible With: Summit and any lift utilizing a loop-style sling. Patient Specific Disposable Slings are designed to make it easy to move a patient or resident and can be used with any patient transfer lift. 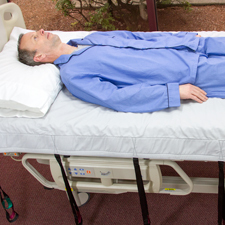 Composed of breathable material, this one-size-fits-all sling can remain under the bed sheet without disrupting patient comfort. The sling is clearly labeled, and can be used multiple times for the same patient or resident. This sling may also be used for lateral transfers. Disposable slings should not be washed. Compatible With: Aerial and any lift utilizing a loop-style sling. A patient-specific repositioning sling is appropriate in some situations where moving or repositioning patients is required. Composed of breathable material, this sling can remain under the patient without disrupting comfort. 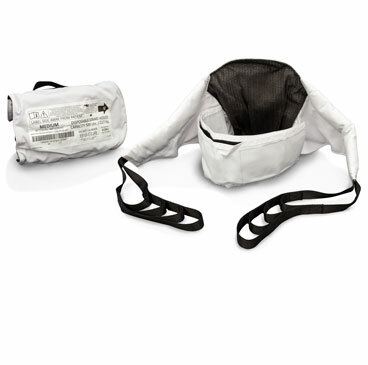 These slings are designed to reduce the risk of infection and contamination. They can be used multiple times for the same patient or resident, but they should not be washed or recycled. Available in two sizes. Ensure that the patient is centered correctly on the sling. 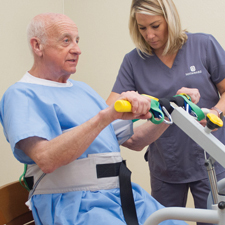 Lift slings from Wy’East work with nearly any loop-style patient lift. Adjust or transfer the patient safely and smoothly. Independent mast and sling bar control, great for car extractions. Maximum weight is 600 lbs. 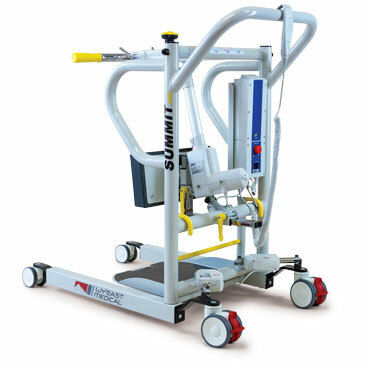 Small footplate for easy maneuverability in tight spaces. Maximum load is 500 lbs. 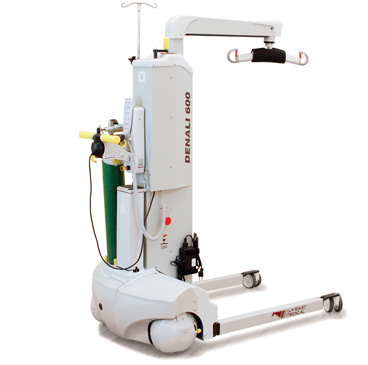 A diverse lift for floor recover, physical therapy, transfers and more. Maximum load is 600 lbs. 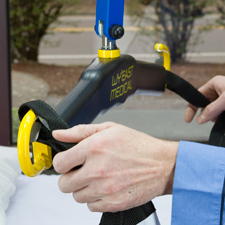 Slings from Wy’East Medical are routinely used on lift equipment that is not manufactured by Wy’East Medical. Read our Compatibility Statement. The patient to be transferred must be assessed by a qualified professional before attempting to lift and transfer. Before using the sling, familiarize yourself with the proper method of sling attachment and lift operation. You can find this information in the operator’s manual provided with your lift system. Inspect the sling carefully before each use. If fraying, seam separation, or other damage is visible or suspected, dispose of it immediately and replace it with a new sling. Finally, never exceed the weight limitations of your lift or sling, as serious harm to the patient or caregiver may result.